1,244 Properties Found. Page 1 of 70. Encircled by some of the world’s best beaches, championship golf courses, upscale dining and shopping and superb year-round sunshine, Naples waterfront communities come alive with the promise of an enriched lifestyle in one of the State of Florida’s most prized communities. The inviting region surpasses one’s expectations when it comes to attaining a new level of luxury, from the finely appointed homes and sweeping waterfront properties in Naples to the boating lifestyle available with easy Gulf access, all surrounded by the exquisite beauty of Southwest Florida at every turn. While the stunning white sand beaches invite residents to lounge on the waterfront or experience a variety of water sports, boaters are sure to delight in boat docks and boat ramps that lead right to the Gulf, with some of the best locations for sport-fishermen, plus the easy availability of things like paddle boarding, canoeing or kayaking. With so many impressive waterfront properties in Naples, Florida to choose from you’ll find numerous fantastic views and enviable properties at your fingertips. Naples waterfront homes come in a variety of styles and price points too, giving prospective homeowners the opportunity to indulge in the level of luxury they desire, with some of the most spectacular Naples waterfront homes available within a variety of communities and neighborhoods. From single-family homes that sit directly on the Gulf of Mexico to those with impressive canal or bay views it’s possible to experience the luxury of Naples waterfront real estate with a large variety of unique real estate options. In fact, when it comes to Naples waterfront communities in Southwest Florida they may all share a waterfront address but they come with a great range of enviable features and amenities. From private docks and swimming pools to public marinas and clubhouses, Naples waterfront real estate affords the distinction of living surrounded by an enriched water lifestyle, from the emerald hues and white sand to the blue, sunny skies that make Naples waterfront homes for sale some of the most highly desired real estate in all of Florida. 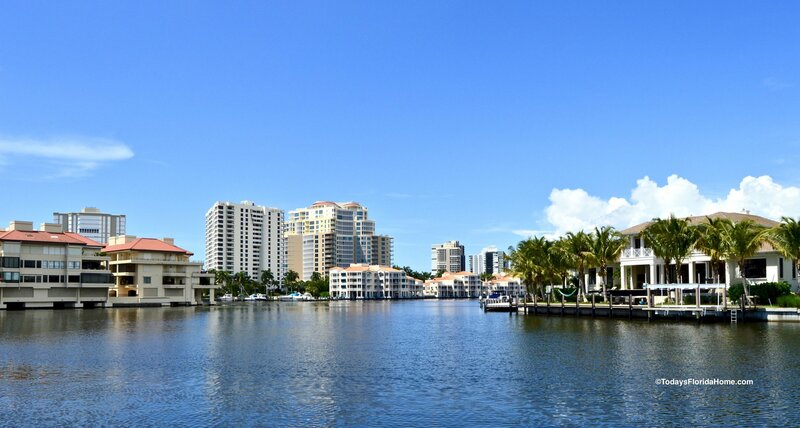 The impressive waterfront communities of single-family homes and properties include those with direct Gulf access, plus lakefront homes and even waterfront golf course communities, making real estate in Naples so exceptional in terms of location and added amenities. With magnificent scenery, a relaxing vibe and a beachfront location, the homes of Olde Naples range from private beach access and complete ocean views to lake views. You’ll easily discover sprawling new waterfront construction homes in Naples and beachfront estates here, along with charming cottages, displaying classic Florida charm. With walking and biking trails, plus close proximity to the beach, residents of Olde Naples also delight in some of the best options in upscale shopping, dining and art galleries spanning nearby 5th Avenue South. As well, many homes are within walking distance of popular 3rd Street South and Tin City. Just to the north of Olde Naples, The Moorings is the epitome of old luxury, with magnificent waterfront views on the bay or the Gulf. The neighborhood maintains a rich blend of old and new styles, from vintage homes that have graced the community for decades to newer construction designs with the latest in designer features and finishes throughout. With sand and water right at your doorstep you are sure to enjoy boating and sailing, plus easy Gulf access and a private beach. The nearby Village on Venetian Bay provides upscale waterfront dining and shopping with spectacular views. As well, The Moorings Golf Course & Country Club offers up an 18-hole course, providing a spectacular option for waterfront golf course communities in Naples. Nearby Coquina Sands, meanwhile, welcomes new residents with a strong sense of community with some of the most impressive offerings in waterfront Naples homes with direct Gulf access. Many of the estates include boatlifts and boat docks, with magnificently designed residences. Whether you choose from a newly renovated older home or a new construction home, Coquina Sands has plenty to offer. Close to everything, residents enjoy a short stroll to the beach, biking to downtown attractions or a short drive to 3rd Street and 5th Avenue. As well, the nearby Naples Beach Hotel & Golf Club offers an array of extra amenities with tennis, golf and a spa. Also close to the upscale shopping districts, Aqualane Shores provides homeowners the advantage of deep-water canals. With some vintage homes, as well as new construction, waterfront estates, the homes of this neighborhood often include boatlifts and deep-water docks, with direct access on to the Gulf and Naples Bay. With some of the best custom-built homes available, Port Royal offers a world-class neighborhood, with the benefit of canal access, plus bay front and beachfront estates and homes. This upscale neighborhood commonly commands prices well in the multi-million dollar range, with residents gaining access to the private Port Royal Club, providing such extra amenities as tennis, fitness, fine dining and more. The advantages continue with sensational Pelican Bay, one of the area’s best Gulf front communities. Residents delight in access to a community center for fitness plus the member owned, Club Pelican Bay, with 27-holes of golf, dining and social activities. With two grand single-family home communities, Bay Colony provides luxury living with old world quality evident in the homes and the surroundings. With beachfront mansions and a gated entrance one of these neighborhoods provides the highest in luxury and exclusivity, all bordered by the natural beauty of mangrove forests and exceptional beaches. With grand bay front and lakefront lots, Park Shore exudes the height of luxury in waterfront living, as well. The single-family homes of this neighborhood often include private boat docks with access on to the Gulf. As well, Park Shore residents enjoy private beach access and a prime boating lifestyle. The waterfront amenities extend to Vanderbilt Beach, featuring canal front homes with private boat docks, private swimming pools and an excess of outdoor living and entertaining space. As well, residents are mere minutes from sites and attractions such as Delnor-Wiggins Pass State Park. A Naples Bay lifestyle also affords the luxury of waterfront living in one of Southwest Florida’s best locations, putting an excess of watersports and outdoor recreation easily within reach. You are sure to find a spectacular selection of homes in Naples Bay. From the advantage of Naples Gulf access homes to the luxury of new waterfront homes in Naples, we invite you to come discover some of the most impressive offerings when it comes to luxury real estate in Southwest Florida.